Entrance to Lehman College of the City University of New York (CUNY) on Goulden Avenue, June 2014. Today's Lehman College campus was originally the Bronx campus of Hunter College (both are part of New York's City University system). Lehman's Historic Campus page states that the “the first four buildings in the plan—Gillet and Davis halls, the Music Building, and the Gymnasium—were completed in 1931 by the New York State Works Progress Administration”. If you look up the history of this campus, almost every source you'll find contains words to this effect, but the fact is that the campus and its four original buildings (Gillet, the Gymnasium, Student Hall which is now called Music Hall, and Davis Hall) were built before the WPA even existed[2,10]. The New Deal contribution came when the WPA was formed in 1935, and consisted of "general alterations to existing buildings. Completion of north athletic field. Construction and reconstruction of roadways, service lines and sidewalk. Erection of an ornamental iron fence and gateway and completion of foundation wall. Landscaping thirty-one acres. Erection of flagpole and waterproofing of underground connecting tunnels." A fifth building, the Administrative Building, was planned (image at right, building with tower). A proposal to the Federal Public Works Administration (PWA) was approved in 1935 but the building was never built. Meanwhile, as noted in some of the Times articles below, state- and/or city-level forms of work relief were used in the earlier ground-clearing and construction; these might be attributed to the administration of New York State Governor Franklin D. Roosevelt, but so far no clear direct evidence has been found. Yet given the prevailing conditions and the establishment of FDR's Temporary Emergency Relief Administration (TERA) in 1931 and early federal New Deal programs such as FERA and CWA in 1933-34, it's hard to believe that the New Deal (especially if you accept that it really started in 1931 with TERA in New York) was not also providing labor for the construction of the buildings. Thanks to Mason Williams, author of City of Ambition, for help with this site and for the WPA image above left. Click to magnify it; you can see the Hunter gothic-look buildings and the WPA sign. A lot of New York Times articles from 1929-1937 are cited, mainly to show the chain of events and the involvement of relief labor in various phases of campus construction. The most important references are 15-21. 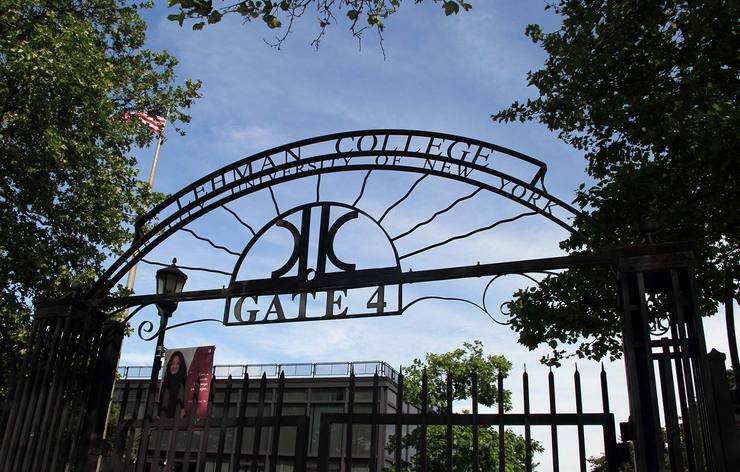 "Lehman's Historic Past", Lehman College of the City University of New York website, accessed July 2018: "[Lehman] College took over the campus that, since 1931, had served as the Bronx branch of Hunter College, known as Hunter-in-the-Bronx. Adjacent to the historic Jerome Park Reservoir, the first four buildings in the plan-Gillet and Davis halls, the Music Building, and the Gymnasium-were completed in 1931 by the New York State WPA." 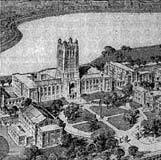 Hails Walker's Aid in Higher Education, New York Times, 16 September 1929, p.11: "The administration [of New York City Mayor Jimmy Walker] ... had appropriated $3,900,000 for the first two units of a group of Gothic buildings for Hunter College on the site of the Jerome reservoir... The development ... was placed under the jurisdiction of the Board of Higher Education, which was created by the Legislature in 1926. The board found 4,500 acres of beautiful property, already owned by the city, on the Jerome reservoir site in the Bronx ... it asked that the land be assigned to it as the site for a new and thoroughly adequate home for Hunter College. Mayor Walker's response to the request was quick and effective. The board not only got the land but along with it an initial appropriation of $1,400,000 to start building. This was followed by another appropriation of $2,500,000, giving the Board of Higher Education $3,900,000 for the firm establishment of the greatest college for women ever undertaken by any municipality in the world." Bronx Realty Men Expect Good Year, New York Times, 2 Mar 1930, p.161: "Hunter College Building. The Board of Estimate's committee of the whole has approved plans for the second unit in Hunter College's $6,000,000 building program. The unit will consist of a power house, cafeteria and social centre to cost $513,850. Work on the first instruction unit of the college on the Jerome Park Reservoir tract between Kingsbridge Road and Bedford Park Boulevard is in progress." 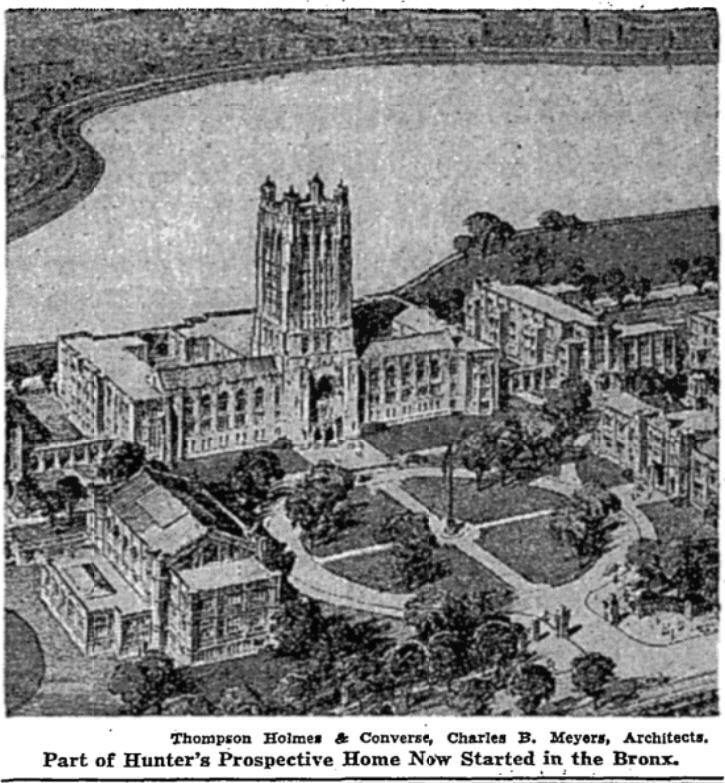 New Hunter Unit Planned, New York Times 8 Jan 1931, p.46: "Plans of another $1,000,000 unit for the Hunter College were filed with the Bronx Bureau of Buildings yesterday. The proposed structure, a two-story gymnasium, will cover a plot 223 by 85 feet at the southwest corner of Navy Avenue and Bedford Park Boulevard. Plans were filed also for a one-story storage building to cost $125,000 on an adjoining site. The gymnasium is one of fourteen buildings planned by the city for the college's new location on the Jerome Park Reservoir site. The first unit, a $1,000,000 classroom building, begun in June, 1929, is now finished." New Builder Asked for Hunter College, New York Times 12 Mar 1931, p.36: "Education Board to Act Today on Plea for Cancellation of Old Contract Because of Delay ... The building is about half completed and work has been virtually at a standstill since December because of a dispute [contractor stiffing workers]. The new Hunter College was to have have been ready for occupancy next August, but the delay ... will probably prevent removal to the new building before next February." Hunter College Unit to Be Named, New York Times 24 Sep 1932, p.32: "The new Hunter College Building in the Bronx, now known as Instruction Unit 2, would be named Davis Hall, in honor of the late George S. Davis, second president of Hunter College, it was announced yesterday." Hunter Head Faces Complicated Task, New York Times 30 Apr 1933, p.64: "Of course Hunter looks to a happy issue out of this particular difficulty [overcrowding, lack of space and resources] in the near future when its new buildings are completed in the Bronx -- from which borough, oddly enough, more than half its students are now drawn. Already is sophomores ahd half its freshmen are studying there, enjoying the unaccustomed luxury of modern recitation halls, a new gymnasium with swimming pool and a social hall containing cafeteria, lounges and a little theater. Squads of the unemployed under emergency relief work programs are levelling the surrounding campus for tennis courts and playing fields. But the main, towered building, which is to contain assembly hall, library, laboratories, classrooms and offices, is not yet built." Table of Savings in New City Budget, New York Times 7 Feb 1933, p.2: Major cutbacks in city budget, including to Hunter College. $250,863,624 Works Deferred by Board, New York Times 10 Feb 1933, p.19: Deferred: Hunter College, one year: $5,196,182. The Graces in College, New York Times 28 Jan 1934, p.141: "Eugene A. Colligan, Hunter President, said "Up in the Bronx under-classmen have at the start the inspiration of better surroundings. Four of the projected nine buildings there are now finished and we hope to obtain Federal funds to proceed with another soon." Tea to Honor Hunter Teacher, New York Times 15 May 1934, p.15: "Professor Mary F. Higgens, head of the education department at Hunter College, will be guest of honor today to be given by the the Bronx Newman Club in the Student Hall at the Bronx buildings." $9,000,000 Is Voted for City Repairs, New York Times 6 Oct 1934, p.2: "Board of Estimate Allocates Federal Loans for Various Public Improvements ... Federal [PWA] loans aggregating more than $9,000,000 for various improvements within the city were approved yesterday by the Board of Estimate. [Including] Purchase and installation of illuminating fixtures in Hunter College gymnasium, $65,800." A Milestone for Hunter, New York Times 10 Feb 1935, p.153: "Only 2,505 upper freshmen and sophomores have enjoyed the advantages offered by the four buildings opened since 1931 on the partly completed campus at Bedford Park Boulevard and Navy Avenue in the Bronx. Plans for the erection of the administration building, which will accommodate more than 3,000 students, have been approved by the Board of Estimate of New York City and by the Public Works Administration of the Federal Government, but the funds have not yet been released." Allots $77,689,296 for Projects Here, New York Times 6 Jul 1935, p.3: "WPA Approves Program for Street, Building Repair, Many Other Jobs. 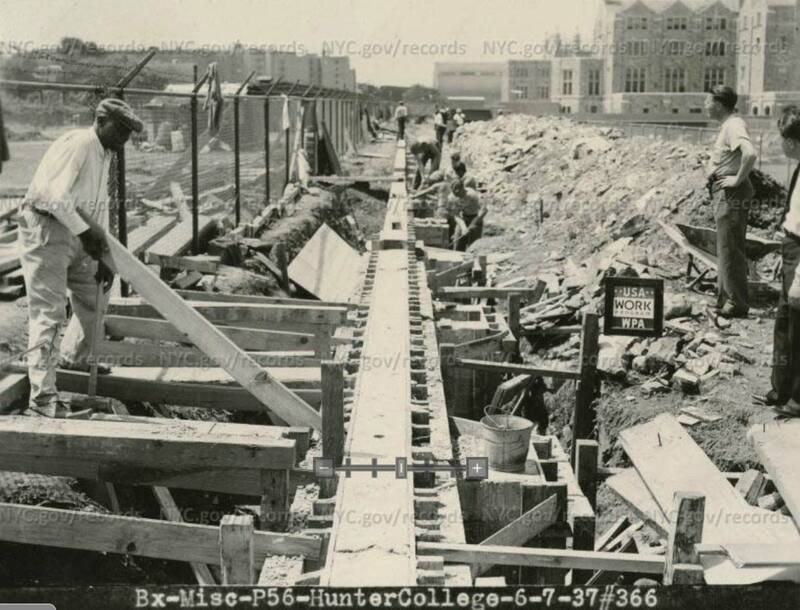 Among many other items: Completion of campus athletic field, Hunter College, Bronx: $368,705 (labor), $132,000 (other)." Moses Keeps Job On Works Relief, New York Times, 7 Jul 1935, pp.1,16: "...the Hunter College initial [WPA] allotment of $500,605 for the completion of the campus athletic field will finally total $1,000,000 when appropriations are granted..."
27 Issues of City Offered by RFC, New York Times August 20, 1935: "Bids Are Asked on New York Total of $6,431,000, Taken Over From the PWA. $44,000 Higher Education, Hunter College Improvement--Serial bonds, being part of an authorized issue of $50,000 and maturing: $4,000, July 1, 1936-46, inclusive." This item shows that there was some PWA financing at Hunter, but which campus? Hunter College Mapping a Program of Expansion, New York Times, 27 Sep 1936, p.102: Photo caption: "Five buildings have so far been opened in the Hunter Bronx group, on the shore of the Jerome Avenue reservoir. Landscaping around the handsome Gothic structures is still far from complete, but WPA workers are making progress." Somervell, Brehon, "WPA Administrator Here Reviews Expenditure of $409,195,154 Federal Funds, New York Times, 16 August 1937. Brehon Somervell was the Works Progress Administrator for New York City. He writes: "The completion of the campus at Hunter College and the extensive repairs and alterations at the City College are chief items of WPA expenditures for the Board of Higher Education. Construction work at Hunter, all of which involves future maintenance by the city, has cost $1,339,518." Clearly he is speaking of the Bronx campus, since construction at Hunter's Manhattan campus was a PWA project and was not completed until 1939. WPA Projects Here to Get $17,228.521, New York Times, 30 Dec 1937, p.21: "The city-wide Department of Public Works established under the new charter will have at its disposal $6,000,000 in WPA funds, under authorizations received from President Roosevelt last night by Lieut. Col. Brehon B. Somervell, local Works Progress Administrator ... The projects approved by the President, the amounts allotted and the descriptions presented in the application Washington follow: Alteration, renovation and construction of public buildings under the Department of Public Works of New York City, $6,000,000. Hunter College. General alterations to existing buildings. Completion of north athletic field. Construction and reconstruction of roadways, service lines and sidewalk. Erection of an ornamental iron fence and gateway and completion of foundation wall. Landscaping thirty-one acres. Erection of flagpole and waterproofing of underground connecting tunnels. $316,302." $23,798,601 WPA Aid Is Allotted to City, New York Times, 5 Jan 1938, p.15: "...President Roosevelt ha[s] approved allotments totalling $23,798,601 of WPA funds for non-Federal projects in New York City [including] Improvement to buildings and grounds at Hunter College, including development of the north athletic field, $316,382.